REGINA, Dec. 6, 2017 /CNW/ - Input Capital Corp. ("Input" or the "Company") (TSX Venture: INP) (US: INPCF) has released its year end results for the 2017 fiscal year. All figures are presented in Canadian dollars. "Fiscal 2017 has been a profitable year of growth and expansion in many areas for Input Capital," said President & CEO Doug Emsley. "Not only did we successfully launch our new marketing stream, we expanded our client base by 168%, grew capital deployed by 42%, increased adjusted streaming sales by 37%, increased adjusted EBITDA by 16%, initiated a quarterly dividend, and became a Canadian Grain Commission licensed and bonded grain dealer. "We are very excited about marketing streams because they require less upfront capital, have higher returns with less risk to Input, and are designed to help every farmer improve their bottom line. 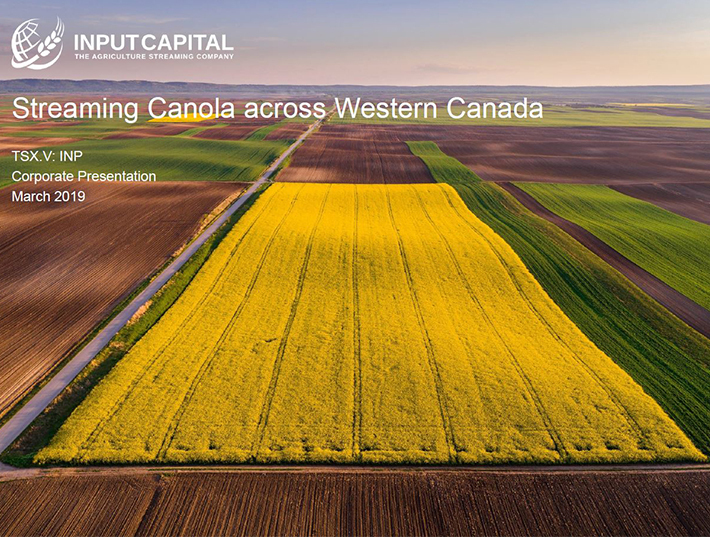 Combined with capital streams, they represent what Input Capital is all about – helping farmers improve their bottom lines by improving working capital and canola marketing opportunities." Adjusted net income1 of $1.792 million, or $0.02 per share. This is a decline of 29% from last year and is a result of planned investments made in client acquisition and the launch of marketing streams, positioning the company for strong future growth. In December 2016, Input initiated a quarterly dividend. It has made four dividend payments to date, paying out a total of $3.280 million to shareholders. 1 Non-IFRS financial measures with no standardized meaning under IFRS. For further information and a detailed reconciliation, refer to "Non-IFRS Measures" beginning on page 27 of the MD&A. *Upfront payment per tonne reflects upfront payments made into both Capital Streams and Marketing Streams. For more information about Marketing Streams, refer to discussion on Marketing Streams beginning on page 14 of the accompanying MD&A. For the fiscal year ended September 30, 2017, Input generated adjusted sales from streaming contracts of $35.767 million on the adjusted streaming volume of 75,285 MT an average price of $475 per MT. The sales from streaming tonnes plus net settlements from streaming tonnes for the twelve months ended September 30, 2017, represent a 40% increase in quarterly volume over the comparable period one year ago, when the Company sold 53,949 MT of canola equivalent for revenue of $26.044 million for an average price of $483 per MT. For the quarter ended September 30, 2017, Input generated adjusted sales from streaming contracts of $13.681 million on adjusted streaming volume of 28,799 MT for an average price of $475 per MT. The sales from streaming tonnes plus net settlements of canola interests for the quarter represent a significant increase in quarterly volume over the comparable quarter one year ago, when the Company sold 15,916 MT of canola equivalent for revenue of $7.656 million for an average price of $481 per MT. For the fiscal year ended September 30, 2017, Input recorded gross capital deployment of $36.794 million (compared to $25.825 million in the same period last year) into 202 streaming contracts for the right to purchase more than 307,000 MT of canola over the life of the streaming contracts. Net deployment for accounting purposes was $32.507 million. During the twelve months, Input added 189 new contracts; 134 in Saskatchewan, 52 in Alberta and 3 in Manitoba. The remaining contracts were renewals, expansions and of existing contracts. During the comparable twelve month period ended September 30, 2016, Input added 33 new producers to its portfolio. During the twelve month period, Input's average upfront payment per tonne was $112.23 compared to $280.49 in the comparable period last year. The upfront payment per tonne reflects upfront payments made into Marketing Streams which are lower than Capital Streams, bringing the upfront payment per tonne down substantially. As of September 30, 2017, Input's active streaming portfolio consisted of 301 geographically diversified streams. 221 of the Company's canola streams are with farms in Saskatchewan, 71 are located in Alberta, and 9 are in Manitoba. The Company is pleased with its continued growth across Alberta and Saskatchewan over the last year and expects to continue diversifying its asset base across the Prairies in FY2018 as it continues to add new streams to its portfolio. The quarter ended September 30 is always the slowing period of the year for capital deployment. For the three months ended September 30, 2017, Input recorded gross capital deployment of $1.751 million (compared to $1.784 million in the same quarter last year) in upfront payments into 11 streaming contracts for the right to purchase over 10,000 MT of canola over the life of the streaming contracts. During the quarter, Input added four new producers to its streaming contract portfolio; all of them in Saskatchewan. The remaining contracts were renewals, expansions and restructures of existing contracts. During the comparable quarter last year, Input added five new producers to its portfolio. During the quarter, Input's average upfront payment per tonne was $171.16 compared to $181.84 in the comparable quarter last year. The upfront payment per tonne reflects upfront payments made into Marketing Streams which are lower than Capital Streams, bringing the upfront payment per tonne down substantially. As a result, Input now controls more physical canola per dollar invested than at any time in its history. For more information about Marketing Streams, refer to discussion on Marketing Streams beginning on page 14 of the MD&A. This is the time of year when the level of activity at Input picks up substantially versus the quiet summer months. Input's business is highly seasonal, both in terms of when the Company signs up new clients and deploys capital (starting in October and building slowly to a climax in February through June), and in terms of when it receives canola deliveries and records revenue (starting in August or September, depending on the pace of harvest, and running through to the end of March). Except for farmers in the area of southern Saskatchewan that was very dry this year, prairie farmers generally had a good growing season in 2017 featuring a combination of good yields, strong prices, and smooth harvest weather conditions. These factors have contributed to good near-term liquidity for farmers and has the potential to contribute to lower demand for the Company's capital streams. On the other hand, confident farmers tend to expand, and management has previously found farmers who are expanding to represent a good market for capital streams. It is too soon to predict which will be the dominant outcome this year. As a result, management has discontinued the practice of providing guidance regarding annual capital deployment. Management's objectives for the year are to continue growing its client base by deploying capital into both capital and marketing streams, and to do so at a level which is greater than the previous year's capital deployment. Since its founding in 2012, Input has grown its annual capital deployment by a Compound Annual Growth Rate (CAGR) of about 18% and management plans to continue to grow deployment year-over-year.